The information contained in this catalog is true and accurate at the time of printing. Nothing in this Catalog or Student Handbook is intended to create (nor shall be construed as creating) an expressed or implied contract. The College reserves the right to modify, change, delete, or add to, as it deems appropriate, the policies, procedures, and other general information in this Catalog or Student Handbook. All information (including the academic calendar, admission and graduation requirements, course offerings and course descriptions, and statements of tuition and fees) is subject to change without notice or obligation. Any changes made after official publication will be noted in the appropriate section by date of change. 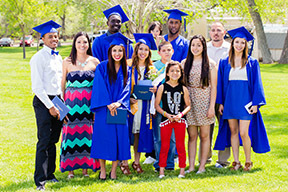 Beginning July 1, 2011, the US Department of Education has each college to disclose a variety of information for any financial aid eligible program that “prepares students for gainful employment in a recognized occupation.” Gainful employment information for each of LCC’s Titlle IV-eligible certificate programs can be found on each certificate program’s webpage. For additional information regarding the data provided and what it means to students, please feel free to contact Chad DeBono, vice president of Administrative Services & Institutional Effectiveness at 719.336.1517 or chad.debono@lamarcc.edu. For more information regarding Gainful Employment disclosure requirements, see Consumer Information Disclosure in this catalog.